This is the extraordinary collection of Dr Dennis T. Lanigan, a surgeon from North America who fell in love with Victorian art while training in London in the 1970s. What you can see in this exhibition are works on paper, from slight sketches to the most complex pieces, such as King Pelles' Daughter above, all of them lovely. The exhibition is spread over two floors and many rooms, and covers themes such as 'Antiquity', 'Biblical', 'Middle Ages' and 'Models', but many of the pictures could be fitted into any of those categories. 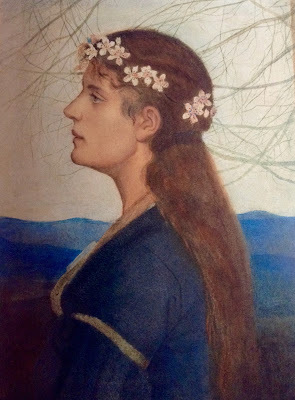 Some pictures, such as sketches for Waterhouse's Lamia will be very familiar to visitors, but others, like Edward Cliffords Mens Conscia Recti (A Mind Conscious of Rectitude) will be new. The prevalence of single female heads, from Leighton and Waterhouse to Burne-Jones and Legros act as touchstones, guiding you from one section to the next until you reach the last room of portraits, the faces of sisters, mothers and lovers of the artists (as well as the artists themselves). The last room is full of familiar faces, clear and glorious. 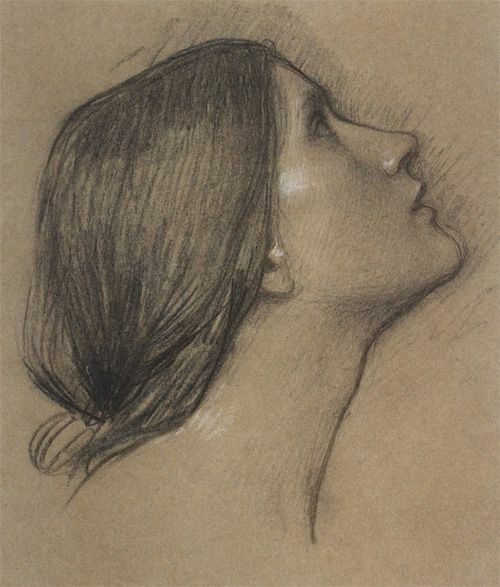 Fanny Holman Hunt faces her sister Edith; Ellen Terry's hopeful face is gazed at by Elizabeth Siddal, crowned by the man who loved her. What this exhibition shows more than anything is that beauty dwells in every moment of paintings, not just its final expression in oil. Many of these pictures were not intended to be anything more than snapshots, captured time in black, white and grey. Some were destined to be works of great scale and colour but here they are in details, a face, some hands, a draped figure, ingredients of the final vision. If I had an observation (which isn't really a criticism) it would be that the exhibition could be seen as a difficult sell if you weren't already invested in the paintings. 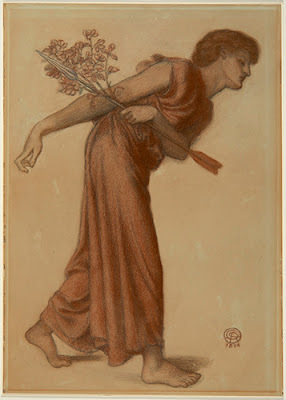 There are some astonishingly beautiful drawings but there are also some very rough sketches of famous works, such as Apple Blossoms by Millais or Morris' La Belle Iseult. For those who know and love these artworks, seeing how the artist built them from lines, curves, and the suggestion of a body under folds of fabric is fascinating, but it might be that the knowledge and love of subject is a prerequisite. In conclusion, this exhibition of 122 pieces is an amazing chance to see all that is delicate and graceful behind some of the most famous Pre-Raphaelite paintings. More than that, it shows the skill of the artists, the love they had for their models, the imagination and vision they applied to their subjects. In this collection, Dr Lanigan has gathered some wonderful pieces of art and has generously shared them with us. It is an irresistible offer I urge you to accept. Pre-Raphaelites on Paper is on until the end of May and further information can be found here. This is an exhibition I would really like to see. I am finding as I get older (should that be 'more mature'?!) that I prefer preliminary pencil or chalk drawings to the finished oils - perhaps they feel more intimate, or perhaps it's the less-finished look that I like. I thought I wouldn't enjoy it as drawings sometimes seem drab compared to the finished paintings but it was wonderful to see them! When we had finished looking round we found that Lannigan himself was in one of the rooms talking about the paintings, it was fascinating. It would have been nice if they had put in more background information either on display boards or in the booklet. It was so nice to bump into you to say and say hello! Thanks for the comments. Yes, Woofwoof, it would be rather good if one of these times I'm not rushing around and can actually have a conversation with you, but it was good to see you! I wish I could see it! I would love to see the house, too! I totally agree with you Kirsty, I too like to see the development of a painting from initial rough sketches to the more polished final drawings. Looks like a very interesting exhibition. 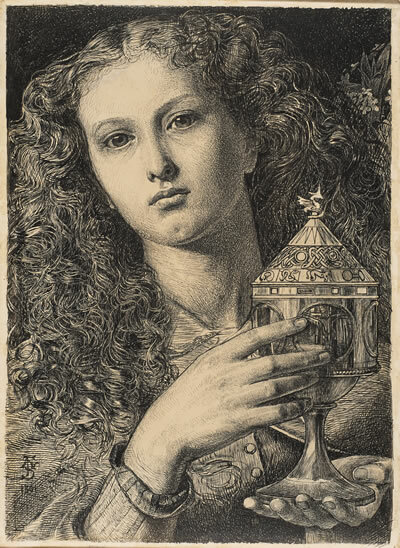 Myself, I will be off to the Preraphaelite Exhibition at The Walker in Liverpool next month and of course the Leonardo drawings exhibition at the Laing in Newcastle. Just back from the UK where I stayed just round the corner from Leighton House. Thank you for alerting me to the exhibition, which I otherwise would have missed. 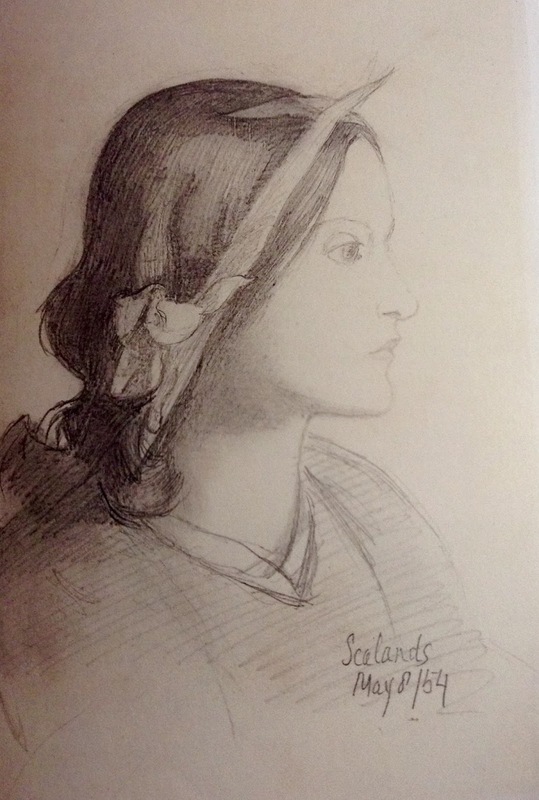 There were cerainly some gems including a couple of sketches by Elizabeth Siddal. An Italian gentleman was holding forth (in Italian) to a young coule about Effie Ruskin and Elizabeth Siddal and I couldn't resist saying, "Scandalous, weren't they!"